This standard establishes the functional requirements for full-scope nuclear power plant control room simulators used for operator training and examination. Criteria are established for the degree of simulation, performance, and functional capability of the simulated control room instrumentation and controls. 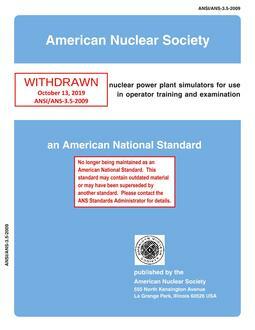 This standard does not address simulators for test, mobile, and research reactors, nor for reactors not subject to U.S. Nuclear Regulatory Commission licensing. This standard does not establish criteria for application of simulators in training programs.